Melted sugar can get very very hot, and since it clings it can burn you very badly. Be very careful when making candy. Do not have little kids running around you when you are cooking candy - let them enjoy the results afterwards. Keep your pan, spatula and so on dry. Don't let water splash into a bubbling pot of sugar syrup - it may spit at you. When adding liquid ingredients like cream, take the pan off the heat before adding. The liquid ingredients should also be at room temperature; cold liquid straight out of the refrigerator has a bigger chance of bubbling up violently and spitting when added to boiling hot sugar syrup. Never, ever, leave a pan of boiling sugar syrup unattended. A candy thermometer is useful to have, but not absolutely necessary. A digital scale is good to have to measure your ingredients accurately. Makes a slab of caramel about 25cm / 9 inches square, to be cut into as many pieces as you like. The quality of your ingredients will really shine through, so get the best, freshest butter, crème fraîche, etc. that you can. Make ready a bowl or large glass or measuring up filled with ice water. Line your baking pan with the kitchen parchment paper. I just use one large sheet, and fold in the corners. No need to grease the paper. Heat up the crème fraîche or the heavy cream-yogurt mixture in the secondary pan until it's lukewarm. Set aside. Put the sugar and syrup into the main pan. Over medium heat, stir until it is all liquified. Lower the heat to a simmer, and keep stirring. The syrup will get progressively darker. Periodically put droplets of the syrup in your bowl or cup or ice water, and scoop out the little balls to see the texture. Once the balls are of the consistency of hard candy, the sugar syrup is ready. You can continue cooking it a bit longer for caramels with a more assertive flavor, but do not let it burn. Note that this part goes rather fast, so check the sugar syrup in the ice water several times. Once the sugar is of the darkness and consistency you want, take the pan off the heat. Add the salt, butter and cream, and stir until well blended. Carefully pour the caramel syrup into the lined baking pan. Let it cool until the caramel is firm - when you touch it, it should not stick to your fingers. Cut it into strips, then cut the strips into squares. I like to cut it into tiny little squares, resulting in about 120 or so squares from this amount, but you can cut them smaller or larger. Any ragged edges on the cut pieces can be gently smoothed over with your finger. For gifting purposes, wrap each piece in little cut squares of cellophane, wax paper, or kitchen parchment paper. You may want to keep this in the refrigerator if it's very hot where you are right now, but do not keep longer than a month or so (if that will ever be an issue). I have specified Tate & Lyle Golden Syrup (also known as Lyle's Golden Syrup), which is a boiled down pure sugar syrup. Using this makes the initial part of the sugar cooking process go very quickly and without hitch. If your local supermarket, Whole Foods etc. doesn't carry it, you can get it from Amazon Grocery in the U.S. I'm assuming it's no problem to get it in the UK or Australia/New Zealand. (In Switzerland you can get it from Britshop or any place that caters to the Brit expat community.) If you must use a substitute, use a liquid (not solid) honey. Do not use corn syrup or pancake syrup. If you can't get a hold of crème fraîche, use heavy cream with some active-culture yogurt instead. Sour cream is not an option, since it can curdle when heated. Add a teaspoon of pure vanilla extract for vanilla caramels. Experiment with different flavored honeys. Add a tiny sprinkle of fleur de sel on top for salt caramels. Submitted by maki on 2009-02-03 14:37. Hello! I love this blog and you're probably too important to respond, but just wanted to say it is absolutely fabulous! :) I look to your site for inspiration. do you have any tips. I make homemade caramels. several local shops want to sell them. however, even when stored in the refrigeration they crystallize and turn fudgey after a short while. is there any thing I can do? any cooking tips? any additives I can add to make them ast longer? they are fine when just made! タンタンメン? I've never really bothered trying to make it, because I always ate it at ramen stalls..
Actualy its russian/soviet union invention. you can buy those it in most russian or central asian shops. (just ask for iris or iriska) sometimes with choco or vanile taste. I think a lot of countries have caramels like this. It seems that the inspiration for those dairy farmers in Hokkaido was 'caramel moue' from Brittany in France. That would be "caramel mou"; "moue" is also a French word but it doesn't really mean the same thing. We'd love for you to join our recipe card swap! Share your favorite recipes and get some new ones to try! Check it out! Tell your friends! Oh WOW. I've never tried making candy before, but this will be the recipe that sends me over the edge. Boy howdy, does that sound wonderful! Wow! This is a great recipe. I absolutely love raw caramels and adding the salt is a great way to convince people that mixing salt with sugar is really quite delicious. I had a question about ingredient substitution. As opposed to using Tate & Lyle Golden Syrup you said that honey can be used or perhaps molasses, but not corn syrup, in place of the golden syrup. I am not sure if it is widely available in Europe or not as to my knowledge Agave only grows in Mexico, but a popular syrup here in the states is 100% pure Agave Syrup. There are a few different grades of it, and I almost always have the dark stuff on hand. 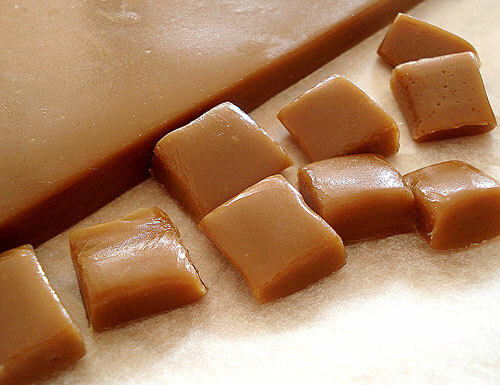 I am thinking about trying to make these caramels this weekend, and I was just wondering what your thoughts were on using Agave Syrup. I haven't experimented with agave syrup, since it's pretty expensive here. You could certainly try it. The problem with corn syrup is that it has a rather high water content, compared to golden syrup, or what you might use in Japan which would be mizuame, or syrup made from malted rice or potatoes. In theory though, any high-sucrose content syrup should work here, but the amounts may differ. Anyway, if you do try out the agave syrup please let me know how it went! I went ahead with the 100% agave syrup and it worked out perfectly. I also used the heavy creme/yogurt combo that you recommended as I could not find Crème Fraîche anywhere, Whole Foods and the high end grocery store near me did not seem to sell it. I have never made soft caramels before and this was quite a good experience. I will definitely have to experiment with this a bit more. I picture myself adding nuts and coating in chocolate to make little candy bars. Btw, to anyone thinking of making these I strongly recommend investing in a candy thermometer. I was lucky to have one leftover from my home-brewing days. That sounds great. Thanks for reporting back Eric! I'll have to try agave syrup sometime. Mix together in a metal container, cover with cheese cloth, and place in a warm draft free are for 2-3 days, untill thick. Refridgorate, and use within a few days. I can't begin to tell you how giddy I got when I came across your blog tonight! It's like a new one-stop site for all the good Japanese food I aspire to make (I own Tsuji's, Japanese Cooking- A simple art) but find it's difficult to find the ingredients I need to make even a decent dashi in our little Norwegian town. I think it's so great that you have such a broad culinary background and I adore your photos. Keep up the good work! I'll be checkin back in frequently. OMGOMG!! You are so in my mind!!! I live in Tokyo and I discovered Hokkaido raw caramels last weekend when I chanced upon a store in Ginza that sells Hokkaido products! The ones i love need to be kept below 10C, they are soooooo addictive and the taste is soooooo superior to other types of caramels. I just want to thank you for your blog. Its fantastic! 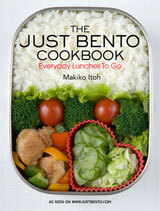 I have learned so much about Japanese cooking from visiting just this one place! I took live near Chicago and took your basics list to the Mitsua mall and stocked up, came home and had my very first miso soup, and made my Japanese essence in a bottle which caramelized my first tofu in my brand new wok perfectly, served over my first (and successful) attempt at sticky rice! I am beside myself happy that I discovered you and your easy to follow guide into a food that is completely new to me. You have so much information I think I'll never get through it all. Once again, many thanks! In New Zealand, although it is possible to get Lyle's Golden Syrup, Chelsea is the local brand. Don't know what they have in Australia. Just FYI as fermentation is a side-hobby of mine - a better substitute for the cream/yogurt would be mixing a teaspoon or so of sour cream or buttermilk in with the cream and letting it sit for 1-2 days until thickened. This is because the cultures for yogurt are different from the cultures for creme fraiche/sour cream/buttermilk - they are thermophilic (heat-loving, yogurt grows best at 105-120 degrees F), whereas the others are mesophilic (they like room temperature). I tried this recipe twice. Once with honey and once with molasses. I tried to get that soft, chewy texture that your posted picture showed, but as it turns out, I always wound up making hard, toffee-like candy. They tasted great (although the caramels made with honey tasted more like butterscotch than caramel) but I still can't seem to get the caramels to get that chewy softness. It's during the second stage of boiling (after you add the butter and cream) that the eventual softness of the caramel is determined. You probably need to stop cooking it a bit earlier than you have been. You should stop when some droplets of the mixture dropped in cold water form a soft ball that just about holds together in your fingers, rather than a firm ball. Oh, first there was the sukiyaki recipe, and now after a long-needed revisit there's the yatsuhashi and THIS? Oh, man, oh man. I need a week or so to play in the kitchen now. I love reading your recipes--still swear by the one for okonomiyaki! Thank you so much for your wonderful site. I have a question about transporting the raw caramels. I wanted to send them cross-country to a friend and I know you said "don't keep them for more than a month" but do you think it will be a problem if they undergo some temperature fluctuations during shipping? I really want to make them but I'm a little nervous my gift will end up as a big lump of goo... thank you! If you want to send them in the post, I would wrap the pieces individually in cellophane (if you can't find them locally, try a mailorder place such as this), and use the fastest shipping method you can afford. Don't send them during very hot months...or if you do, you'll need to find some kind of refrigerated packaging solution. This might be blasphemous but I was wondering if you were aware of a microwave version of this recipe. I've seen tomy's Nama pot "toy" which only uses milk,cream, and sugar but it's $40. I know this can be done without such an expensive contraption but have been unable to find a recipe. Thanks! Ps. i tried to cook the whole can of condensed milk once to make toffee, but what it turned out to be was toffee-sauce. Very tasty tough. This recipe is the first i found that really works and gives the amazing results it promises. Thank you so very much. I have now tried the plain ones and the chocolate caramels (into which I added some dried apricots). It definitely helps so much to have a candy thermometer. I found it quite hard to get the softness right before, even with the ice water test. While I kept to the recipe in most respects, I omitted the golden sirup, and just took 300 gr of sugar, added a scant cup of water and a sqeeze of lemon juice. This works great, and if you do not want the sirup or honey/molasses for taste reasons, it is easy to do (just foolow the same instructions as in the recipe) and saves you the trouble of getting hold of the other ingredients. Thank you again for this great recipe!